This preparatory solution is added to the existing water in your tub and left in for 1 to 5 days. This thoroughly cleans out the spa and plumbing system to remove unwanted chemical, organic, metal and mineral buildup from your spa or hot tub. It is okay to use spa or hot tub during this time. A highly concentrated formula of natural surfactants which break down organic waste,along with a blend of special coenzymes that accelerate natural bio-oxidation and self-purification processes in your spa water. This attaches to your garden hose to filter out unwanted metals and minerals when first filling your spa or topping it off over time. To enhance your filtration system, this fine micron boot attaches to the intake grill in the spa foot well. 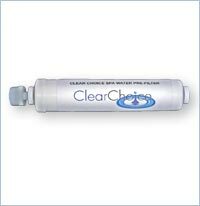 Enhances spa water filtration. Wraps around your existing spa cartridge filter. 1. Remove all spa filters and filtering boots. 2. Open and center all spa jets and air valves. 3. Add Spa Prep as per label directions to spa water. 4. Let spa heat and circulate for the proper time period. (See label on Spa Prep) Spa may become cloudy as the product works. It is okay to use spa during this purge time. New or Empty Spas: Fill spa with water (no hose Pre-Filter needed) and follow above directions. Maintenance: Every 6-12 months depending on usage, do a complete water change by following these same directions. 2. When water stops draining, turn spa power on and run all spa jets for 5 seconds. This will blow out all the dirty water trapped in the spa plumbing. 3. Remove all remaining water and wipe spa dry, using a soft towel or sponge. 5. Reinstall new or clean spa filters and boots. 1. Attach a new Clear Choice Pre-filter to a garden hose. 2. Flush Pre-filter for 1 minute before placing in spa. Fill spa with water. Always use the pre-filter when adding water to your spa. 3. Replace Pre-filter as indicated on label. Home water softeners: If you have a home unit, use the conditioned water along with the Pre-filter to fill the spa. 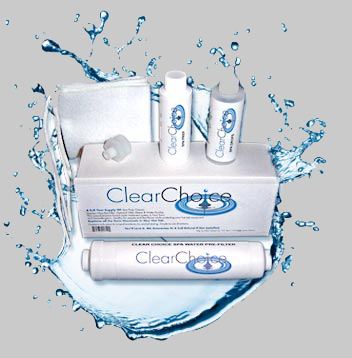 Add Clear Choice Spa Drops As Directed On Bottle. Filter & Boot Cleaning: Weekly-Rinse with high pressure water. Monthly - Soak overnight in clean water and 5 cups of white vinegar. Rinse spa filters and Clear Boots well with high pressure clean water before reinstalling in spa. 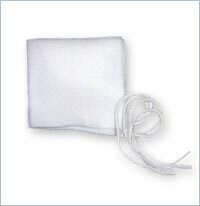 Clean Spa Cover: Clean the bottom of spa cover with a good household degreasing cleaner. Rinse well with clean water. Installing Clear Boots: Install 3” or 5” boot on 1 or more intake grills located at ankle height in spa foot well area. These grills are where spa pumps draw in water for circulation & filtering. Normally one Clear Boot placed on the primary intake grill is adequate. To install boots, roll back the elastic edge, like putting socks on a child, then fold over in place. Ozonators: Clear Choice is compatible with spa ozone units. pH & Alkalinity: Normally adjustments are not needed. The Clear Choice System will automatically settle water pH at 7.8 thru 8.2 and stabilize alkalinity. Your spa and skin are protected from damage by the water hose Pre-filter and special conditioning agents contained in the Spa Prep and Spa Water Purifier Drops. EXCEPTION: (SEE NEW USERS & TUBS BELOW). 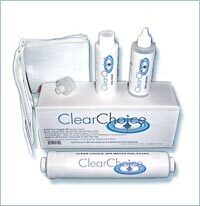 Overdosing: Using too much Clear Choice Spa Water Purifier Drops is the most common problem with this system. Initial overdosing symptoms are excessive buildup of brown residue at the water line and/or around jets. This can also be accompanied by brown tinted water. Soon after the water clarity and odor will be affected. Clean your spa filters and boots daily, skip your next two weeks of treatments. Reduce dosages and clean spa filters & boots more often to prevent future overdosing. Silky Residue: Soft, odorless & colorless residue on spa surfaces are harmless salts. Residue will dissipate with time. White Cloudy Water: After water changes there is often a period of time when water is changing molecularly. During this period water may look white/ cloudy with no signs of overdosing. Add a full initial week’s dose of Spa Drops to correct the problem. Rough Surface Deposits: Sometimes soft or hard deposits will form on spa shell. This can be a result of some final chlorine or bromine salt deposits being flushed from spa plumbing that the Spa Prep purge did not completely remove. Normally these deposits will disappear within a week. If deposits remain, add a full initial week’s dose of Spa Drops. Green Tinted Water: This is harmless and should disappear with time. Normally this is residual metals or minerals in the water that are oxidizing. A green tint can also result from not using a fresh hose Pre-Filter when adding water to your spa. Metals like copper or nickel in non-filtered water are oxidizing. This can also be your 1st indication of overdosing, so check your Spa Drops dosage amount. Light Musty Odor: Normal for new customers during the first 1-4 weeks as the natural spa water sets up. With time this odor (trapped Co2 gas) should only be noticeable when you first open your spa cover and release the steam. Floaties: Light flakes in water are non-toxic buildup from spa’s plumbing. Clean spa filters & Boots more often. If flakes persist reduce the spa water pH to 7.2 and add 2oz of Spa Prep to the spa water wait 6-24 hours then follow the directions above (After Purging Spa). To prevent future build up, adjust and maintain the spa water pH at 7.6 thru 7.8. New Users & Tubs: Check and maintain a water pH of 7.6 for the first 2 months using pH test strips and any common pH product from your local spa store. After that period pH adjustments should not be necessary as you continue to use Clear Choice. Clear Boots & Poor Water Flow: If after installing Clear Boots you find that they are restricting flow through the spa plumbing or are causing spa pumps to shut down; cut a small hole in the center of the Boot to improve water flow, try placing the Boot on another intake grill or just stop using them at all. You may find that after a few months your spa will function fine without the boots. 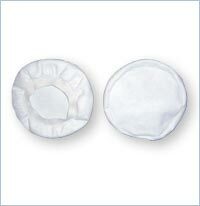 The Filter Sleeve enhances the filtering efficiency of the standard cartridge filter in your spa. It is designed to work with our Natural Spa Water Treatment System. The Filter Sleeve is designed to fit most spa cartridge filters. The sleeve is based on area coverage and may or may not cover your entire spa cartridge filter. You may also need to cut a couple of holes in the Filter Sleeve if when the sleeve is new it overly restricts the normal water flow through your spa’s filtering system. Roll the sleeve under at one end if it is too long for your spa filter. Clean the Filter Sleeve weekly by spraying with high pressure water from your sink or garden hose. Monthly: Soak the sleeve in a small container of water and 1 cup of white vinegar. Soak for 1+ hours, rinse well and then reinstall in spa.